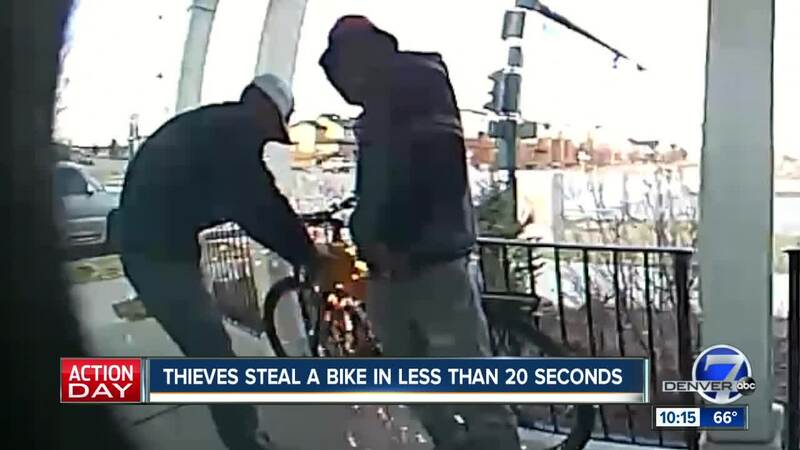 DENVER — There's only so much you can do to protect your bike from an experienced thief. Gregg Looker did more than most, yet it was as if he'd done nothing at all. "My Ring Doorbell caught two segments," Looker said. "First, they were walking up, came around here, stood here looking at the bike. And then two minutes later, they've got a grinder, and they were watching this, and they cut right through here in 20 seconds." More like 12 seconds, start to steal. Looker's lime-green Specialized Expedition was locked up to an iron railing on his front porch next to what may be the busiest intersection in Stapleton. A Kryptonite U-lock looped was around the frame, and a tracking device was secured under the seat. Then the perfect storm: He was out of town, his normally barking dog was staying with friends — and that tracking device? "So of course when my bike gets stolen, I open up my Tile app, and it has been sending me messages for two years saying the battery is weak. So, when I need it, the battery is dead," he said. He ordered a new bike and plans to keep it inside. Looker said he learned even the best lock is no match for an experienced crook. "A guy with a grinder and 20 seconds can blow through a Kryptonite lock," he said. Denver averages about 125 bike thefts a month. If that sounds like a lot, bike thefts are actually down 30 percent this year. You can register your bike with the Denver Police Department and file a stolen bike report.